Before we tear the blaster apart, let's look at the drums. 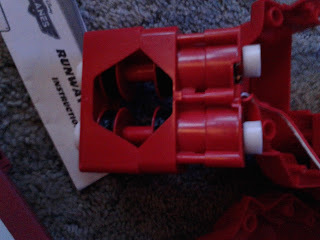 Each one holds 36 darts, and are removable for reloading. The drums have 36 gear teeth around their perimeter, and mesh together when mounted on the blaster. They also have a series of ridges (72, to be exact) that can be engaged in single fire mode by a ratcheting mechanism. 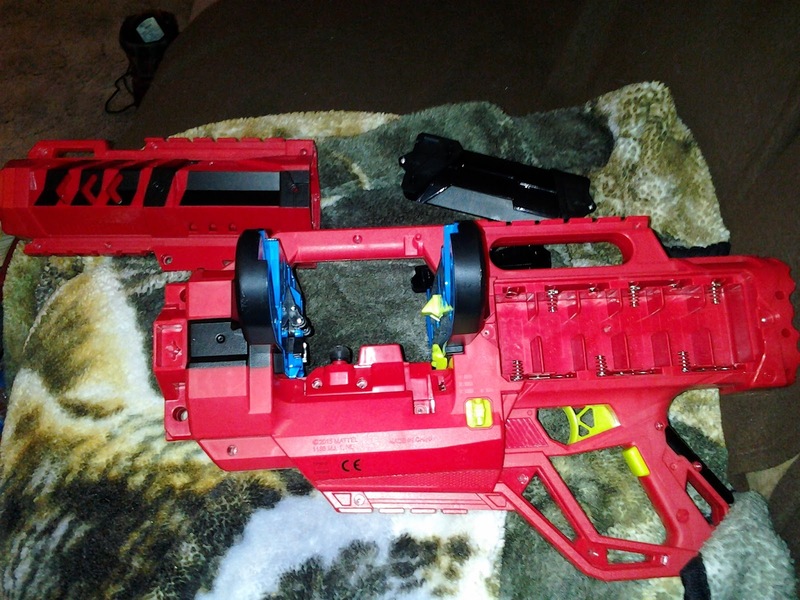 Now for the blaster shell! 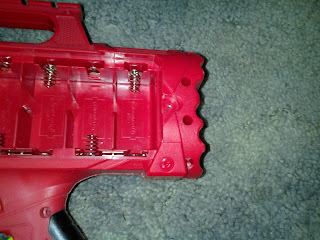 When you remove the outside screws, you'll notice that the front barrel and grip are easily taken off. Oh look, we've already minimized it! These pieces are what hold the drums in place during use. If you have them installed already, they are surprisingly easy to remove. Each side has a small well with a black lever you can move to disengage the clamps. There is one snag in dismantling the shell; the faux rivet design at the back of the shell actually hides a long metal pin. It's far easier to just cut the bar with a Dremel or other rotary tool then to try and pry things apart. 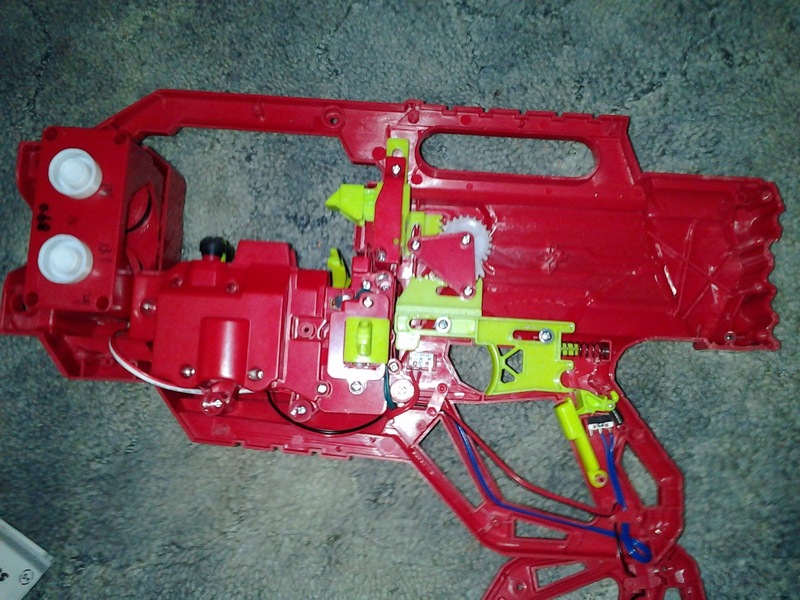 Once the shell halves are separated, it's fairly easy to deduce the function of various parts of the blaster. 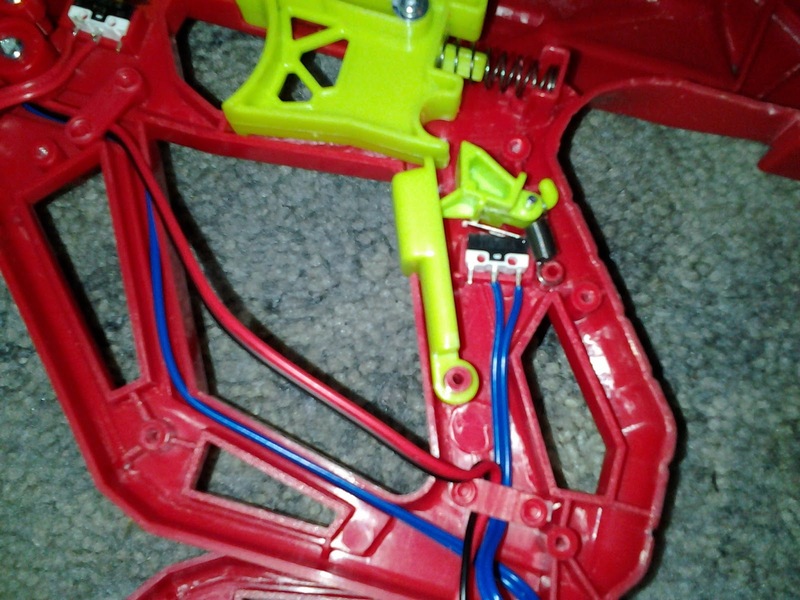 Note that the batteries sit in the shell half not shown below, and have wires connecting the shell halves at the bottom of the grip. 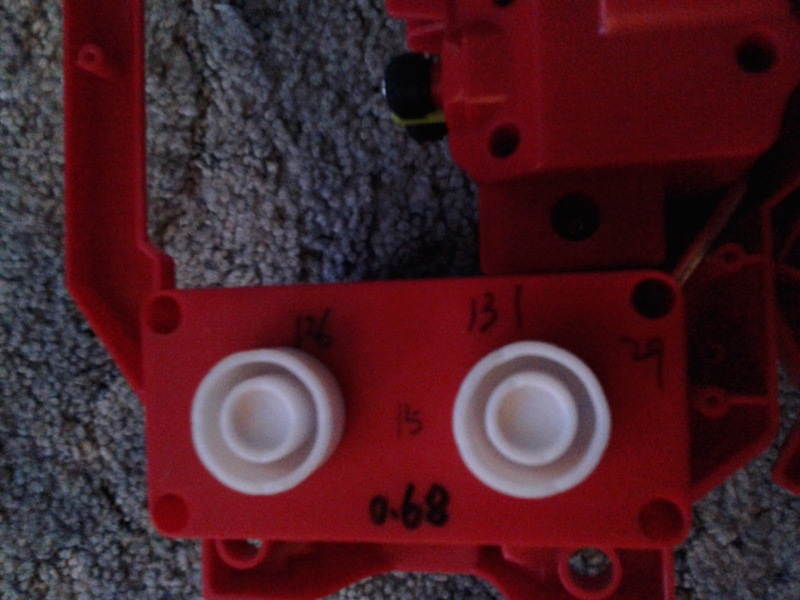 There are several microswitches throughout the blaster, all marked with their design rating (2A 125VAC). All are wired up in the same fashion: one wire on the common terminal, the other on the Normally Closed terminal. 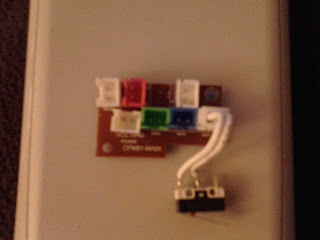 All switches sit in the open position (no connection) by default. The one in the center of this picture is activated when you press the acceleration button. Here we see the microswitch pressed by the actual trigger. We can also see some funky gear work that sits behind the drums. 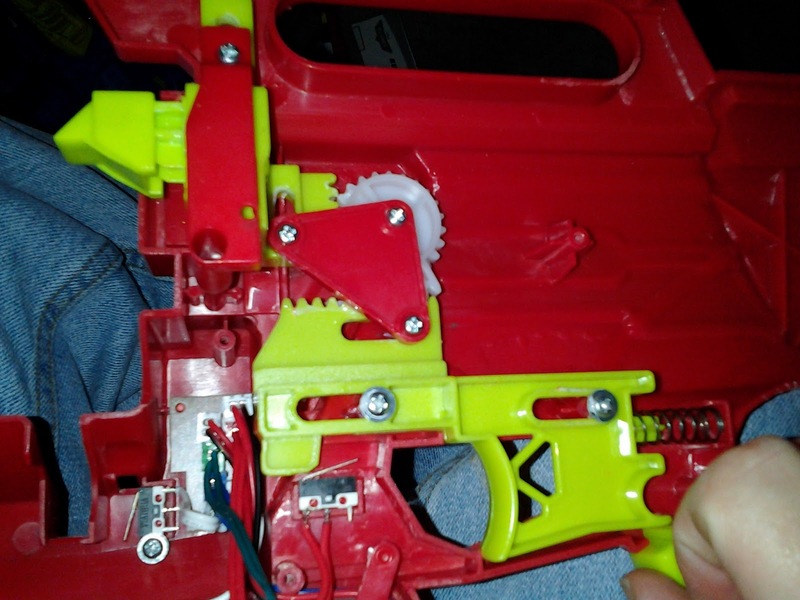 From this angle, you can see that the gears result in that spring-loaded, yellow-green ratchet moving down when the trigger is pressed. When operating in single shot mode, this ramp advances each dart drum by 5°; the drums sit in a staggered orientation so that the darts shoot one at a time, back and forth between drums. 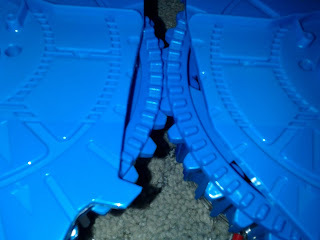 On trigger release, the ratchet slides over the ridges in the back of the drums and resets itself. 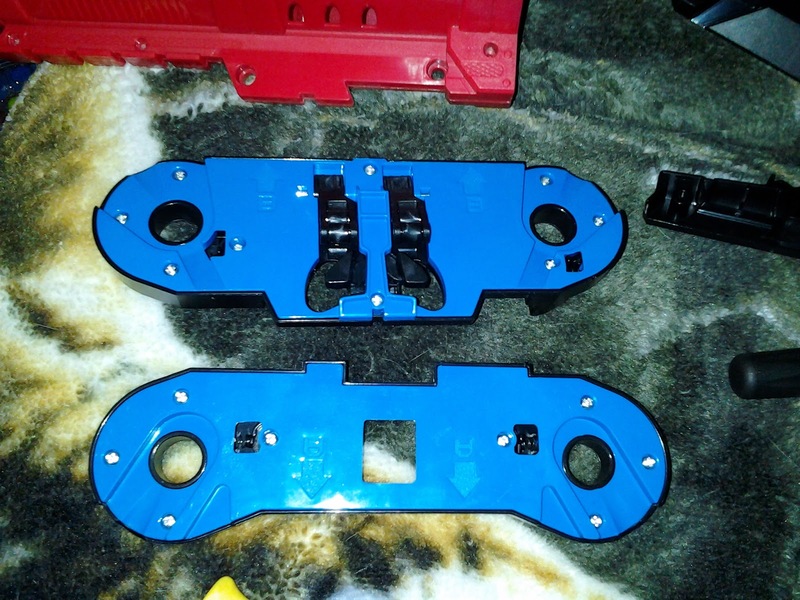 Here's the case for the flywheels and their motors. The writing on the plastic was there when I opened the shell. Presumably it was done during assembly. The rubber bumpers sit between the motor casing and its mounts in order to help with noise reduction. You know, so you only have a normal buzz instead of OH MY GOD IT SOUNDS LIKE A GIANT WASP NEST!!! 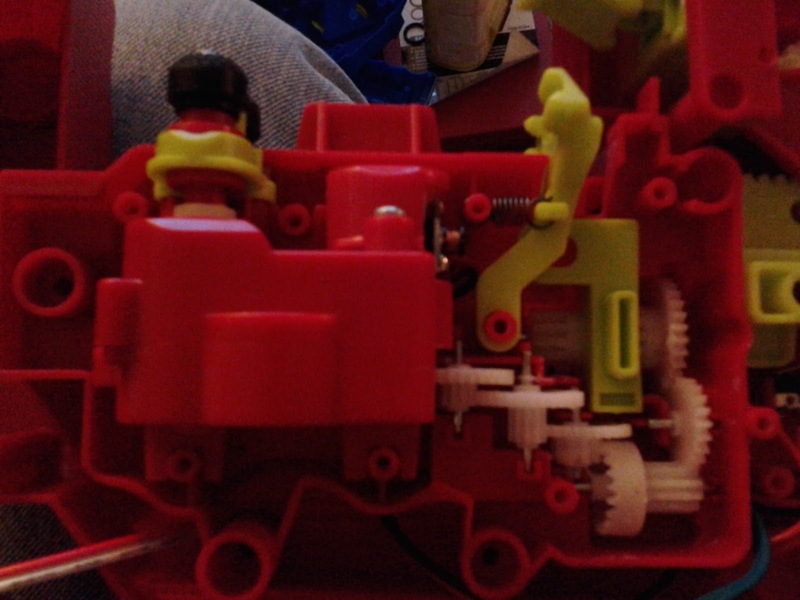 Here you can see the rather large flywheels each motor drives. Thanks to a few slots molded into the motor casing, it can only sit one way inside the shell. 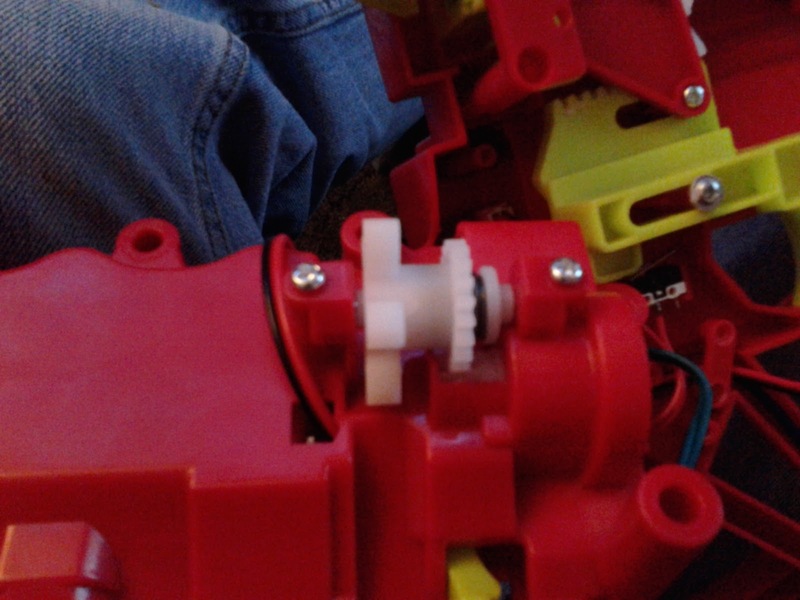 And here's where power feeds into the flywheel motors. 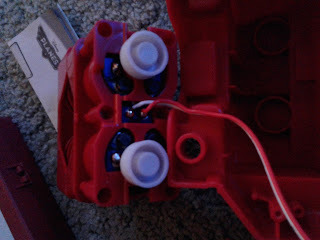 Six screws are hiding the electronic board the motors are mounted to. Now for the dart advancing motor! This motor drives, among other things, these small wheels that come into contact with darts as the drums progress through their cycle. Essentially, it's a pusher arm replacement. They aren't the only thing that motor operates, though. 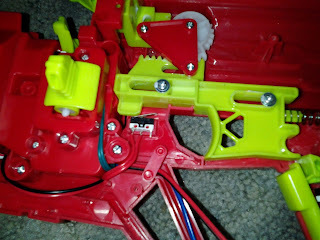 Open up the central assembly and you can see the motor casing, gear box, and the levers that connect to the fire select switch. The gears step down the rotational speed of the motor shaft significantly, trading speed for torque. The "fingers" standing up are part of the ammo drum ratcheting mechanism, and they sit against the ridges at the back of the drums we mentioned earlier. They keep the drums from turning unless you pull the trigger and ratchet the drums. 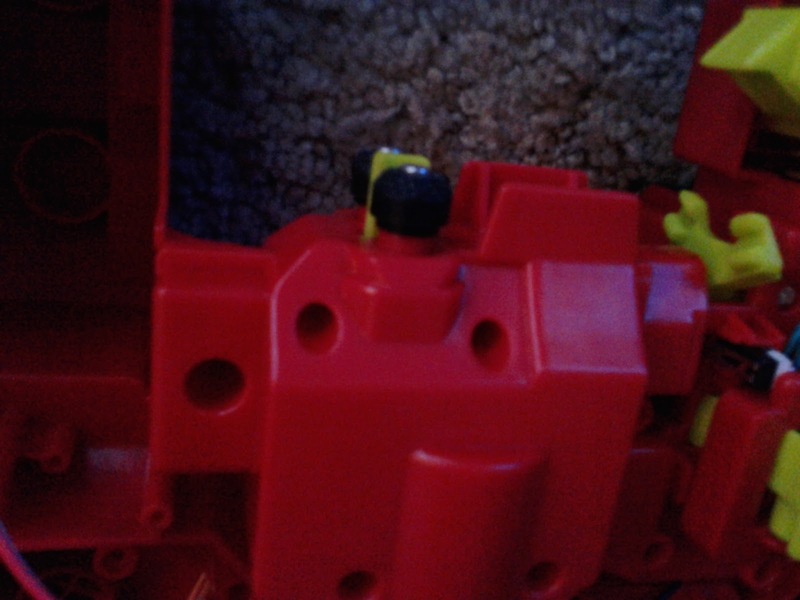 In full auto, however, these fingers are pushed back to allow for free rotation of the ammo drums. 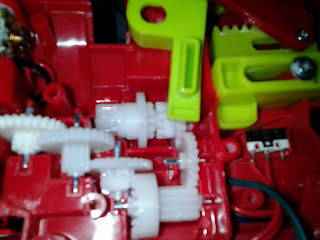 In addition, moving the switch causes the yellow-green slide underneath the finger lever to engage a clutch gear, connecting the gear box assembly to gear teeth on the drums. 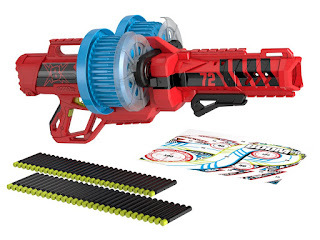 This gear on the outside of the casing is what finally connects the entire thing when full auto is activated. If you're in full auto, this last gear makes the drums rotate. In single fire, with the clutch gear disengaged, it is essentially a free spinning gear. 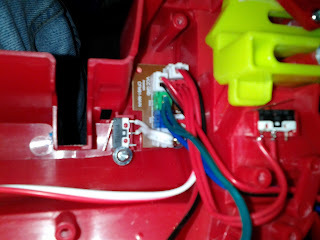 Finally, we look at the circuitry. There's a single board sitting underneath everything, with each plug running to a different motor or switch. Here you can see one of the two safety switches that only connect when the ammo drums are fully inserted. On the other side, you can see the circuits printed on the board. The flywheels, drum safeties, and acceleration trigger all lie on their own circuit path. When the normal trigger is depressed, some of the current is drawn through two diodes and then the pusher motor (at lower than 9 volts). Finally, we have the boards attached to the motors (Flywheel motors shown, but this also applies to the pusher motor). 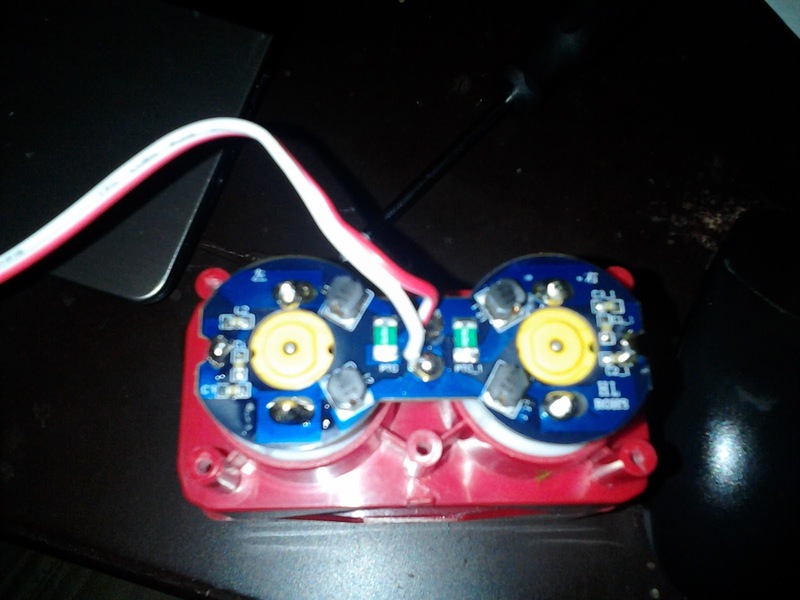 In the case of each motor, current runs through a re-settable thermistor, two inductor coils, and the motor terminals. In addition, there is a third connection to the motor casing, linked to the circuit through a series of capacitors. 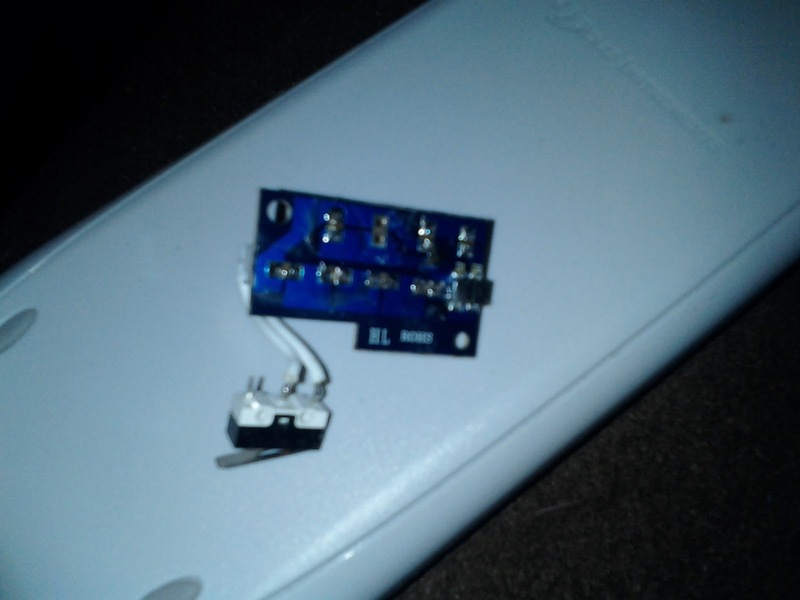 This dissipates electrical noise induced in the metal casings. 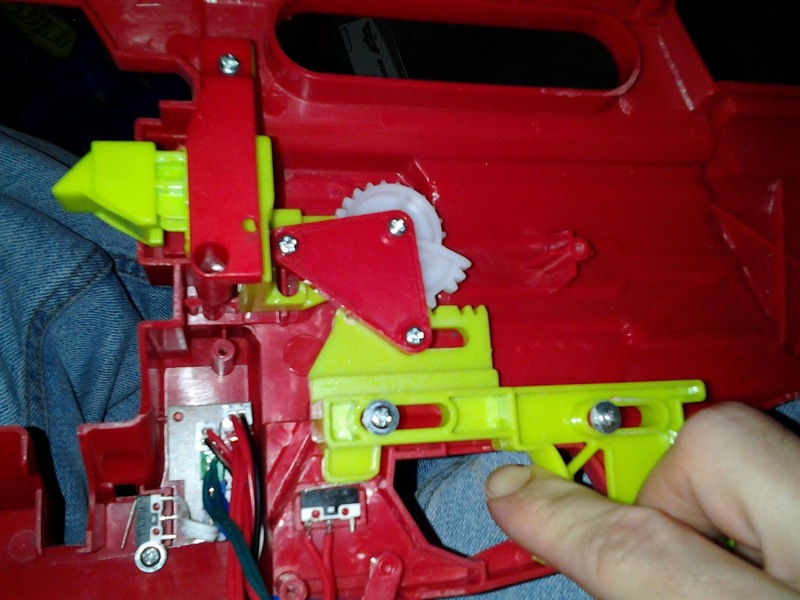 Big thanks to u/-SSGT- over on r/Nerf for the explanation. I'll have a full review up soon, dealing with both stock and modified performance. It'll be a good review, I can tell you that. 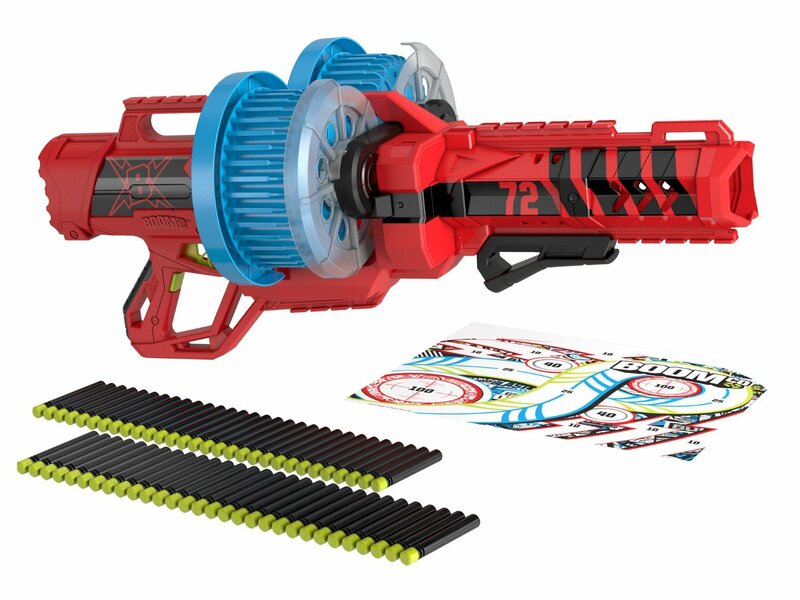 If you want to grab a Colossal Blitz, Target has them on sale this week for $60, which in my opinion is a much better price point for the blaster than the normal $90. Where exactly is the metal pin in the back of the gun?